The patient was a 21 year old man who presented after having a seizure. He had experienced increasing headaches during the prior three weeks, which were relieved with ibuprofen. Shortly prior to admission he developed a transient expressive aphasia. He then experienced right arm trembling which progressed to tonic-clonic activity with loss of consciousness. The patient was a an Indian national who had resided in the United States for the past 7 months. His past medical history was significant only for chronic sinusitis. He admitted to occasional alcohol use, with no history of tobacco or drug use. His general physical examination at the time of transfer to the University of Pennsylvania was benign. He was alert and oriented. His speech was fluent and his comprehension was intact. Cranial nerves II-XII were intact. He had no pronator drift and motor strength was normal throughout. His coordination and gait were normal. Laboratory studies including electrolytes and blood parameters were normal. An MRI scan of the brain was performed. The patient underwent craniotomy for removal of a temporal lobe mass. At surgery the mass was noted to be dural-based and partially necrotic. Total gross resection was performed. The patient received no further therapy. Three months post-operatively he is asymptomatic, with no recurrence of seizures. An MRI of the brain was performed. T1-weighted images demonstrated abnormal signal intensity involving grey and white matter of the left temporal lobe and associated mass effect with sulcal effacement. With contrast administration the left temporal lobe showed a poorly demarcated nodular enhancement measuring 1.6 cm with overlying dural enhancement (Image 01). 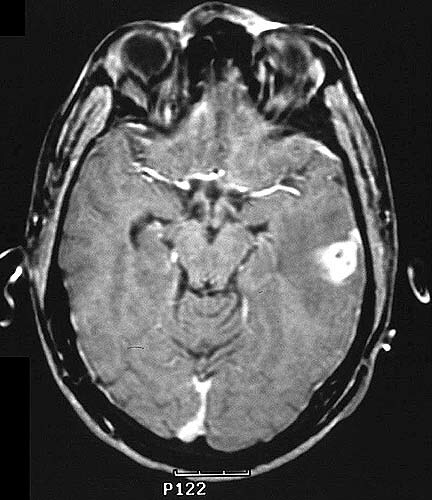 The imaging findings were felt to be most consistent with a primary glial neoplasm.